For over 50 years, David Rudow has combined the hallmark diligence of an accountant with his adept ability to resolve complicated business law challenges to better provide counsel and transactional support to clients in commercial legal matters. Drawing from his background as a CPA and field agent for the Internal Revenue Service, Mr. Rudow is uniquely qualified to provide tax and business law representation for corporations, individuals and closely-held private businesses involving business transactions, mergers, acquisitions, tax controversies and stockholder disputes. He has extensive experience with real estate and healthcare professionals and also represents clients in all aspects of estate planning and administration. 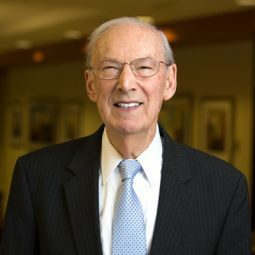 Mr. Rudow has been extensively involved in both local and national professional organizations throughout his career, including chairmanship of the Maryland State Bar Association’s Section of Taxation, chairmanship of the Baltimore Estate and Gift Tax Study Group, committee work in the Tax Section of the American Bar Association and service on the Board of Directors of the Baltimore Estate Planning Council. Utilizing his deep knowledge of tax regulations, David Rudow has frequently lectured at a wide variety of seminars on a range of tax-related matters. Mr. Rudow resides in Baltimore County with his wife, Vivian Adelberg Rudow, a composer, and he enjoys boating, fishing and golf during his leisure time. Maryland Institute for Continuing Professional Education of Lawyers, Maryland State Bar Association, Maryland Association of Certified Public Accountants Chesapeake Tax Institute, and American Health Lawyers Association.